Immersion travel is for everyone at all ages and stages of life. It means taking an active part in where one visits in order to learn about the culture, traditions, and characteristics of each particular place. This book will absolutely change lives and the way people think about travel in the U.S. The goal is to not just visit, but to get involved. 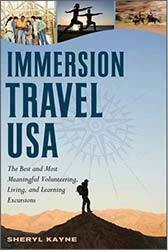 Designed to be a resource and idea book, this guide provides practical information about immersion travel, special considerations and costs, and how to plan and take vacations, sabbaticals, side trips, and more. Helping: Volunteer in Great Locations with Phenomenal People Build affordable housing while biking across the nation, Bike & Build, Philadelphia, Penn. Tutor, mentor, and be a role model for inner city youth, City Year, Boston, Mass. Learning: Education, Self-Help, and Alternative Lifestyles Experience life as it was in a covered wagon tour on the Oregon Trail, Bayard, Nebr. Master quilting, fiddling, blacksmithing, and other traditional crafts, John C. Campbell Folk School, Brasstown, N.C.
Trade farming, gardening, maintenance, or housekeeping for room and board, Wellspring, West Bend, Wis. Build and maintain trails in White Mountain National Forest, American Hiking Society, Silver Spring, Md. Caring: Immersion Travel for Animal Lovers, Caretakers, and Activists Document Atlantic bottlenose dolphins along the East Coast, Dolphins Plus, Key Largo, Fla. Observe millions of bats, Selman Bat Watch, Oklahoma City, Okla. Playing: Enjoy the Great Outdoors, Sports, and the Arts Be totally immersed in an underwater vacation, Jules’ Undersea Lodge, Key Largo, Fla. Go whitewater rafting through Westwater Canyon, Utah, Adventure Bound River Expeditions, Grand Junction, Colo. The book also includes inspirational first-person narratives, like Betsy’s Story, a 45-year-old elementary school teacher who went on a spring break horse-packing trip and enjoyed it so much that she sold her home in Virginia, gave up her teaching job, and applied for the adventure job of her dreams, packing horses and cooking on Allen’s Diamond Four Ranch in the Wind River Mountain Range. They specialize in horses, fly-fishing, pack trips, and elk hunting in the Shoshone National Forest. Throughout IMMERSION TRAVEL USA you will find personal stories about travelers who discovered their passions through different experiences. Kathleen fell in love with dogsledding on a weekend trip and now has 37 Alaskan huskies and teaches people how to mush in Minnesota. Chuck and Dona were so thrilled after attending the National Storytelling Festival that they sold their home in New Jersey and opened a bed & breakfast in Jonesborough, Tennessee. Immersion travel can definitely change your life. Don’t just visit, get involved. 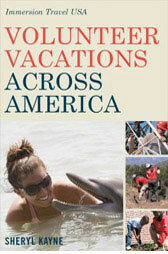 Volunteer Vacations Across America: Immersion Travel USA (Immersion Travel USA) is a travel guide like no other and you’ll want it on your shelf as a reference, though you might find a copy in the library. 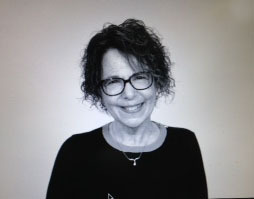 Sheryl Kayne does a thorough job listing every possible opportunity across the country, from bicycling for cancer to stomping grapes or working on an organic farm. You might think “ack, volunteer for a vacation?” but when you read this book, you’ll see how fun, exciting and – most of all – cheap it can be.